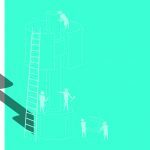 Which process is best for you? Depends on the application. Read on for an in-depth examination of the pros and cons of each. 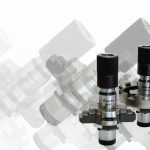 Less than 10 years ago the selection of machinery was a system decision; presently continuous indexing (face hobbing) and single indexing (face milling) are unlimitedly available to the user. 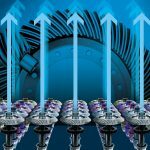 The continuous indexing method, referred to as “face hobbing” (FH), caused a small revolution in North America a few years ago, in conjunction with dry-cutting. Until then, the classic five-cut method had been state of the art for many decades. This is a single-indexing method, which cuts one after the other gaps in the gear blank. For the pinion, a different cutterhead is used for the convex and concave flanks respectively. Single indexing methods are referred to as “face milling” (FM). 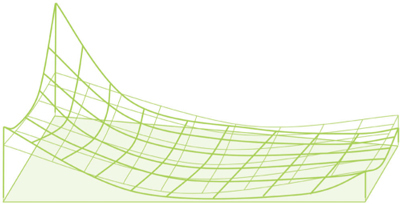 The FM five-cut process is controlled by means of contact pattern assessment. The contact patterns on the drive and coast flanks are moved to the desired shape and position by changing the pinion machine setting. So-called “proportional changes” are used for this purpose. Although the process control is not without problems, all users have learned to adequately handle proportional changes. With the introduction of face hobbing, this condition changed substantially. 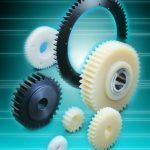 With dry-cutting, it was possible to reduce the processing time per gear set by up to approximately 30 percent in comparison to wet-cutting with the five-cut method. The tool life quantity of the cutter heads was improved by more than factor three. 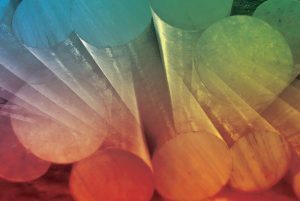 The high-cutting speeds of the carbide blades produce an excellent surface quality, which offers the best conditions for downstream lapping operations. These economic factors were what made the triumphant advance of dry face hobbing possible. 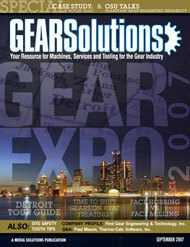 The goal of this article is to make an objective comparison between the two gear-cutting methods. All essential characteristics, such as load-carrying capacity, noise behavior and costs, are assessed. 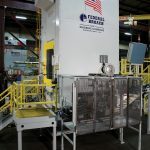 To enable this comparison to be made in a practical manner, we have limited the process scope so that a lapping operation always follows with FH gear sets, while FM gear sets are ground after hardening. 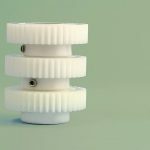 Although the tooth forms of FH and FM gears are very similar, there are still some basic differences. The FH method produces an epicycloidal shape in tooth lengthwise direction. The tooth height is the same at both the toe (the inner end of the tooth) and the heel (the outer tooth end). 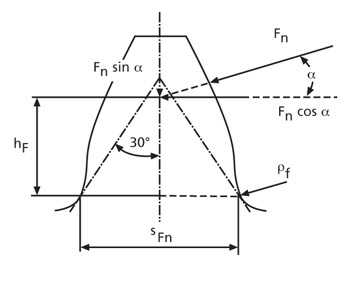 In these cases the root cone angle and the tip cone angle are identical. 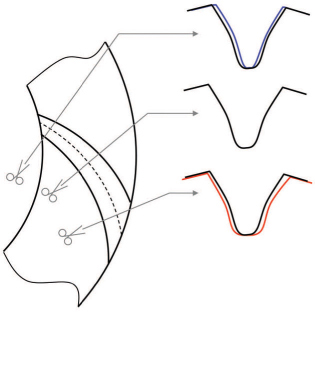 The cone geometry results in a conical tooth tip thickness, and thus a conical trend of the slot width in the gap. With a reasonably sized cutter diameter, the gap at the heel is smaller than at the toe. If the cutter diameter used is too small, the inner tooth end becomes thicker than the outer. Presently, FH gearsets are always manufactured with constant tooth height and conical slot width. Instead of having a constant tooth height with conical gap width, a conical tooth height with constant slot width can be made. In order to achieve this, the tip cone angle and the root cone angle must be coordinated with the cutter diameter to give a constant slot width in the tooth root. This cone geometry is also called a duplex cone. If a gear in an FM gear set is processed in such a way that both flanks are manu¬factured in a single cut, a constant slot width results in the tooth root due to the circular cutter head. This constant slot width of the gear requires a constant tooth tip thickness on the pinion. If one continues this train of thought, then one can easily deduce the basis for the computation of the duplex cone. 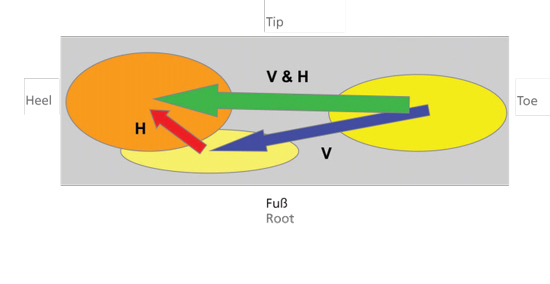 In simplified (partly standardized) calculation methods, the tooth root chord sFn between the 30° tangent to the root fillet ρf and the bending lever arm hF is the critical dimension for determining the tooth root strength (see Fig. 1). Apart from the length of the tooth root chord, the size of the root fillet also influences the notching effect. However, with these calculation methods, all of these dimensions are only considered in the center of the tooth width. Since FH gear sets have a conical slot width and the cutting tool must pass through the narrowest point, it is not the middle cross-section that decides the maximum possible tooth root fillet, but rather the cross-section at the toe of the tooth. FM gear sets, on the other hand, have a constant slot width along the entire width of the gear (see Fig. 2). If in a direct comparison all profile parameters are left as they are in the tooth center, the cutting tool can be almost fully rounded with FM gear sets, allowing a considerably increased tooth root fillet in comparison with FH gear sets. This measure alone would lead to a small increase in the tooth root chord and a considerable reduction in the notching effect, and thus to an increase in the tooth root strength (see Fig. 3). 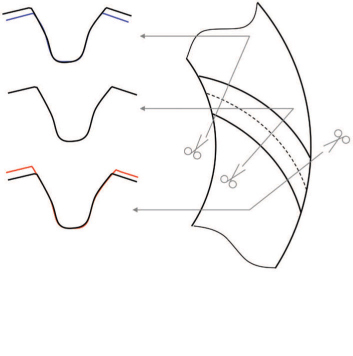 Due to the conical tooth slot, FH gear sets present almost the same radius of curvature along the concave and the convex flank, therefore pinion and gear are conjugated to each other and thus also have no longitudinal crowning. In order to achieve an optimized ease-off with a reasonable longitudinal crowning, only a small cutter head tilt needs to be introduced, which has very little influence on the tooth root curve: the tooth root is largely parallel to the theoretical tooth root cone (see Fig. 4). In contrast, with FM gear sets the radius of curvature between the inner and outer flanks of the tool differs by the amount of the (constant) tooth gap width. With the pairing of pinion and gear, this now results in a substantial longitudinal crowning, which must be reduced by means of a much larger tool tilt in order to achieve optimized ease-off. This tool tilt is now so large that the tooth root is no longer parallel to the theoretical tooth root cone, but is strongly curved (see Fig. 5). This strong curvature leads to a considerably reduced tooth tip clearance within the toe and heel regions of the tooth, and thus to the danger of interference. 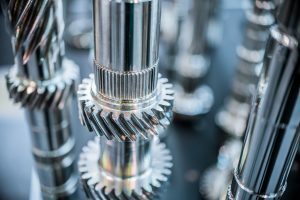 Therefore, FM gears must be designed with increased tip clearance in the middle cross-section as compared to FH gears, unless the mating gear can be manufactured with a suitably complex tooth pointing, deviating from the ideal tip cone. 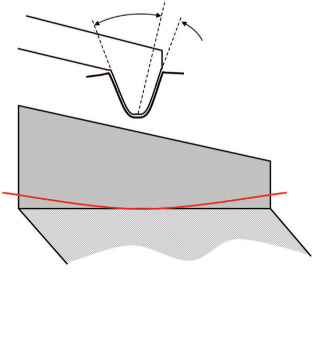 However, an increased tip clearance leads directly to a reduced tooth root area, which in turn only allows a somewhat reduced tooth root fillet, and at the same time to an increased bending lever arm. The previously described advantage of the comparatively larger tooth root fillet is consequently neutralized. It is well known that bevel gears that are manufactured with a small cutter diameter show a different contact pattern behavior under load than gears manufactured with a large cutter diameter. Fig. 6 shows that, using a so-called “rectangular case,” with identically dimensioned V and H displacements acting in opposite directions—as generally occurs in the drive load case—the contact pattern almost constantly remains in one place, while when using a large cutter diameter the contact pattern changes considerably under the same conditions, as the effect of the V and H displacement is no longer in one direction. In addition, due to the previously mentioned fact that the slot width is constant with FM gears, large tool diameter shave has traditionally been used for these gears, since the relative difference of the radii between interior and external flank of the tool is smaller, and consequently less tool tilt is required to reduce the crowning. 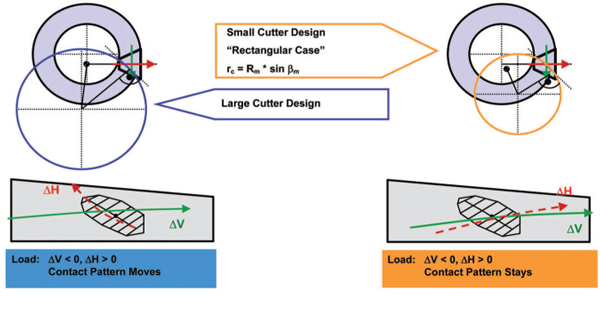 The use of small cutter diameters is partially associated with substantial efforts in the development of a useful ease-off, but this is naturally made possible nowadays by design programs such as KIMoS. With FH gears, however, even the use of tools representing the rectangular case does not present a problem. Previously, when stick blade cutter heads were not known, and therefore only form cutterheads were used, FH gears were manufactured in principle as so-called N-gears, i.e. using the rectangular case. The tool diameter used also influences naturally the load carrying capacity of the gear. On the one hand, the position of the so-called N-point is influenced. This point represents the only point on the flank at which, with epicycloidal gears, the curvature is identical to that of an involute. The normal module of the gear is also largest at this point. With the rectangular case, the N-point is exactly in the center of the tooth, and with large tool diameters it can even be located on a radius outside the heel, so that the point with the theoretically largest normal module is no longer located on the gear. For this reason, and as the contact pattern remains in the center of the gear under load, causing the load distribution in the tooth root to be optimal, gears with a small tool diameter have up to 15 percent higher root strength. In the past, this fact led to the widespread statement that FH gears have a higher root strength than FM gears, even though the latter have a larger tooth root fillet. With regard to pitting resistance, however, the behavior under a collective load is exactly reversed: Since the center of the contact pattern is located at different points with different loads in the case of gears with large tool diameters, the accumulation of damage also occurs at different points so that pitting formation is considerably delayed, resulting in a longer service of the gear. In the case of gears with a smaller tool diameter this effect is not so strong, and a quicker failure of the gear can therefore be expected. High pitch deviations result in dynamic auxiliary forces, which can have a negative effect on both the pitting and tooth root strength. FH gears are lapped after hardening. Although the pitch quality of these gears is generally better after milling than that of FM gears, lapping can only partially improve the pitch errors resulting from the heat distortions. Ground gears clearly have a large advantage here, since pitch errors can be almost completely eliminated during grinding. Fig. 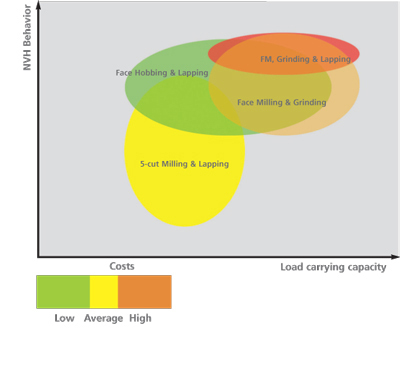 7 shows a comparison of the relevant influences in relation to the load bearing capacity. In summary it can be said that, if all crucial parameters are kept the same, there is no difference in the load bearing capacity of FH and FM gears. 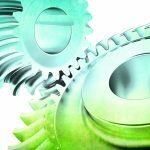 If lower costs are required, higher load carrying capacities can be more easily achieved with continuously milled and lapped gears. However, ground gears manufactured with the single indexing method have the potential to achieve still higher load carrying capacities. Yet this potential can only be achieved with much higher comparative efforts in development and production as, for example, complex tooth flank modifications and adapted tooth tip contours. 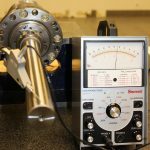 To avoid making sweeping statements with regard to noise behavior, the process-typical characteristics of lapping and grinding must be considered separately. In contrast to the load carrying capacity, the difference in tooth form does not affect the noise behavior. 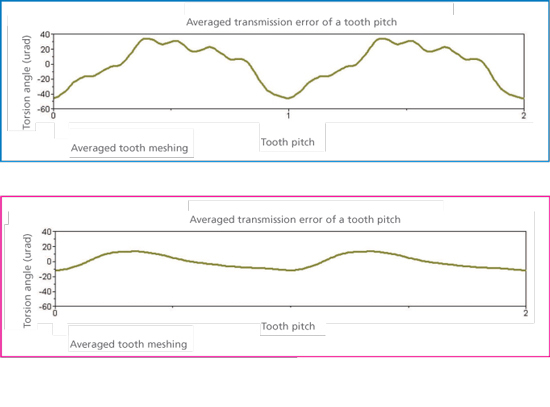 Only the tooth contact is relevant for the noise behavior. Since the tooth contact is affected by the environment, for example bearings and housing, and also by the load, the entire topography of the contact distance—the so-called “ease-off” must be considered. 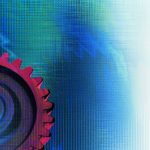 The high geometrical process reliability of ground FM gears allows for a very precise tooth flank surface. The environmental conditions, for example housing and assembly tolerances, are reflected in complex tooth flank modifications. Fig. 8 shows a gear set with typical so called “bias-in” behavior. The housing is deformed under load due to the tooth forces. For the coast side—concave pinion drives convex gear—this results in tooth forces in the direction of the negative axial offset and a larger pinion and gear installation dimension. The altered relative position of gear and pinion displaces the contact pattern in the direction of the heel-tip on bias-in gears. Clearly, large crownings are required in the tooth contact for this load case, to prevent the contact pattern from running over the edge of the tooth. No deflections are expected for smaller load cases, apart from a temperature increase in the housing. The contact pattern will be in the nominal position. The tooth contact must not present any crowning, in order to ensure quiet running behavior. If flank form modifications are performed while taking these two aspects into consideration, a quiet-running and big load performing gear will be obtained. In a load-free condition, the contact pattern would extend to the toe. The slightest housing tolerances will immediately result in edge loading. It is therefore recommended that the tooth contact in the toe-root area be decreased. 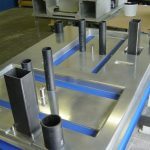 Any assembly or housing tolerances will then no longer result in edge loading. In this manner, the gear will have a robust design. Fig. 9 shows a typical ease-off. The thin lines represent a standard design, the thick lines represent a contact distance optimized in respect of high load and position tolerances. 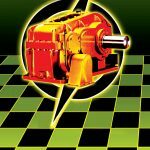 Whether the noise behavior and load carrying capacity fulfill the requirements thus depends exclusively on the quality of tooth flank form and surface in the case of FM gears. When considering the lapping process, it is necessary to first break away from the clear geometric approach of grinding. In lapping, material removal occurs at the point where the flanks touch. Fig. 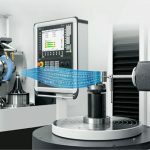 10 shows that, with targeted displacements of the pinion during the lapping process, the contact pattern can be moved over a large area of the flank. With typical bias-in design of the gear, the contact pattern moves in the toe-tip direction if the axial offset is decreased, while if the installation dimension is increased it moves in the toe-root direction. With appropriate configuration of the additional movements during lapping, a targeted material removal can be achieved. Unfortunately, hardening distortions stand in the way of a geometrically stable lapping process. If the hardening distortions are known exactly, the ease-off can be designed similarly to that possible in grinding, using a suitable lapping process. Unfortunately, this only applies to the ease-off and not to the tooth flank form of gear and pinion. 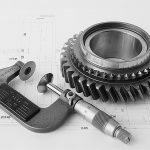 As the pinion always has a higher removal on the flanks, due to the lower number of teeth, it must be rigorously ensured that no lapping edge occurs in the pinion root. The protuberance necessary to avoid this reduces the effective overlap and consequently also the potential for smooth running. 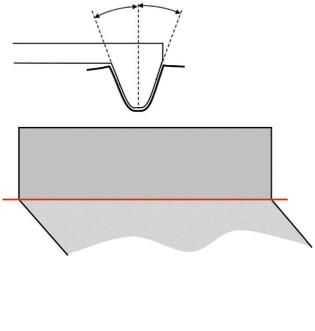 In contrast to grinding, in which the acoustics depend exclusively on the tooth flank geometry, lapping has a natural advantage in respect to noise emission. Any interference in the tooth meshing due to tiny surface defects results in local pressure peaks during lapping. As the lapping removal depends directly on the pressure, all irregularities or other surface defects are therefore lapped away, resulting in a consistently gentle tooth contact. Fig. 11 shows the transmission error before and after lapping a gear set. The quieted trend of the rotational error, which no longer contains any residual ripples, is immediately evident. This natural effect of the lapping, in conjunction with stable milling and hardening conditions, results in a process that does not have a high geometric constancy but offers a high level of acoustic reliability. Fig. 12 shows a comparison of the relevant effects for lapping and grinding. This table does not claim to be complete and is simply intended to give an overview of the fundamental differences. Fig. 13 contains a diagram that takes account of the costs, noise behavior, and load bearing capacity. First, the now outdated five-cut process with subsequent hardening is shown as a yellow ellipse, for orientation purposes. The costs are described as “average.” If we compare this with face hobbing, the color shows that this process is considerably more favorable. In addition, the noise behavior is better and the load bearing capacity has a considerably higher potential. A different cost situation emerges for face milling. 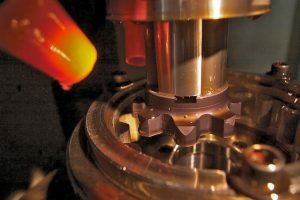 Because the gear set is fine-machined on a machine during lapping, a cost advantage is evident for face hobbing. This illustration further shows that the load carrying capacity of a ground gear set lies in the limit range above that of a lapped gear set. 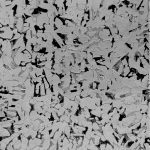 The now seldom-used process of structural lapping after grinding entails higher costs and only reduces the noise behavior range to a narrower, better range. Whether face hobbing or face milling should be used cannot be answered with a simple yes or no. It depends on the intended use of the respective gear. The issue of dealing with heat distortions plays a key role. The larger the heat distortions, the more grinding will be favored, while the larger the quantities and the more reliable the hardening process, the more lapping will be preferred.